Today we have the sweetest little scene card by Maria that is sure to make you smile! Most of the images are from the magnificent Newton Dreams of Paris stamp set! I love the Eiffel Tower in the background of that pink sky!! And the cute grey kitties really pop! There are also hints of greenery around the scene with the little leaves from the Deer Friend stamp set! Isn't that a great way to add more interest and texture to the scene? I love it! She finished off the scene with some impressions she made Land Border Die Set! The sentiment, also from Newton Dreams of Paris, was heat embossed onto the cute little flag! 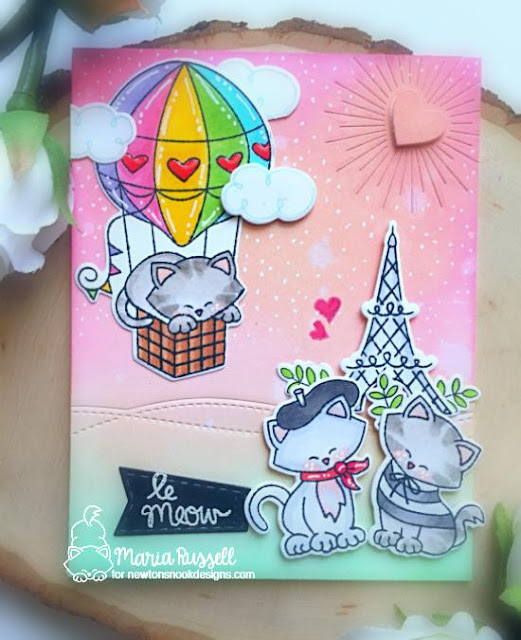 Maria has a video on her YouTube Channel showing how she made this card! Oh, it's so sweet and cute!! Absolutely adorable card. Love it!